Are you ready for end of financial year? Why wait until the end of the financial year to get your accounts in order. You can start preparing at any time throughout the year. If the business’s cash flow is good then it may make sense to spend on extra expenses before end of financial year to maximise deductions. Are all adjustments from last year processed? Have you adjusted the data file for any impact of the end of the FBT year? Have you adjusted the data file for any adjustments by the accountant? A once a year adjustment for private expenses – yes you can. Your accountant may have included an adjustment in last year’s final tax returns for disallowing private expenses – has the GST adjustment been made? It is absolutely acceptable to claim all GST on all taxable purchases for a business or enterprise during the year, if turnover is less than $2m, even if a portion of the expenses are for private use. The ATO allows a once a year adjustment to reduce the amount of GST claimed. When the Tax Agent has completed the end of year tax returns and informed the amount of private expenses, then make a GST claim reduction in the next BAS. Therefore you will have only claimed back the GST on the business portion. So if you are advised there was $1100 of private expenses, then reduce your next GST claim by $1100/11 = $100. You do not have to inform the ATO, just keep the records. If you post the totally private expenses to the loan account and don’t claim any GST back at the time of purchase that is okay as well. If you are processing the payroll for businesses, it is wise to check that no employee receives more than the maximum superannuation contribution, unless instructed by the employee’s financial planner or accountant to do so. Check what the current superannuation contribution caps are. If employees or owners appear to be near or over the maximum the bookkeeper should notify the person in question. While Superannuation Guarantee is not due till the 28th of July, in order to get the income tax deduction in this financial year, the superannuation must have been paid through your bank account before 30 June. 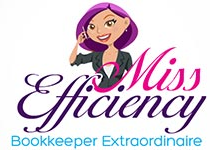 There are a number of ways Miss Efficiency can help with your bookkeeping and end of financial year processes, check them out here. If this is just all too much and you’re feeling overwhelmed, we can help you with that too. Wow … I’m in Business! is jam packed with business tips and tools to help you manage your business and your end of financial year processes. If you need assistance with end of financial year processes, contact us on 0402 811 088.